A return of the award winning hit show from 2018 which is on a UK Tour from 14th May until 28th June 2019. Fresh off its sold out debut run at the Edinburgh Festival Fringe, Strictly Arts will embark on a new International Tour with their award winning show, Freeman; a collaboration with writer Camilla Whitehill (Where Do Little Birds Go? / Mr Incredible) and in association with the Belgrade Theatre and the Pleasance. Inspired by the first American to plead insanity as his defence, award-winning writer Camilla Whitehill and Strictly Arts examine the unspoken link between mental health and systemic racism. Throughout time and across waters, they thread together the stories of Freeman, David Oluwale, Sarah Reed, Sandra Bland, Daniel M'naghten and Michael Bailey to show how these three factors combine in the US and here in the UK. The controversial lives and deaths of these real life protagonists also highlight why it is necessary for movements like Black Lives Matter to exist in the 21st Century. When Strictly Arts began making Freeman in 2016, there were 120 self-inflicted deaths recorded in prisons across the UK - the highest number on record. The company began looking at the parallels between today’s society and past incidents. Government statistics in 2017 showed that there were 31,328 people in prison who, at any one time in the UK, had reported having poor mental health issues - 37% of the average monthly prison population. Yet, only 7,917 prisoners were recorded by NHS England as having received treatment for mental health illness during March 2017. Artistic Director of Strictly Arts, Corey Campbell, comments As an individual who has been a victim of racial profiling, wrongfully accused by the justice system, with friends and family who have suffered from poor mental health, and a member of the black community myself, the statistics and information I’ve researched are both relevant and frightening. To think that William Freeman’s story from as far back as the 1800s can still be an example to us today shows that we are still in dangerous waters. 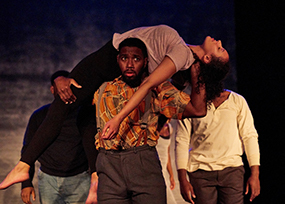 Freeman features a mix of high-energy physical theatre, gospel singing, shadow puppetry and powerful drama to create an extraordinarily moving and affecting experience.